Great news to all Crocs fans out there especially those who live in the south)! Crocs will be having an epic sale this coming May 16-18 at Filinvest Tent and some of the selected Crocs products will be sold for as low as Php199.00. Not bad right? You can learn more about Crocs sale dates by reading their press release below. Have a great day! 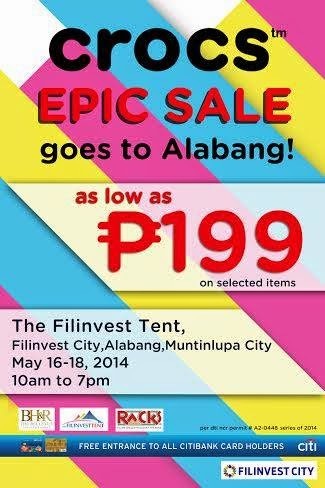 Thanks for the heads up, I will definitely be there as I live about 15 minutes away from Filinvest, woohoo!